A boy sees his family getting killed by villains. Then there is a gap in the story to allow the boy to grow up. And then – Lo Behold! We have the hero of the story – now an angry young man all set to seek vengeance. The villains themselves have grown from strength to strength in the intervening years and are no push overs. Now is the time to grab some popcorn and lean back on the recliner as the hero and the villains cross swords. And in between bring in some pretty young things and throw in some romance as well. Now we have it all – the sure shot recipe for a Bollywood blockbuster. But doesn’t sound the likeliest of stories to hit it off with science fiction buffs, does it? 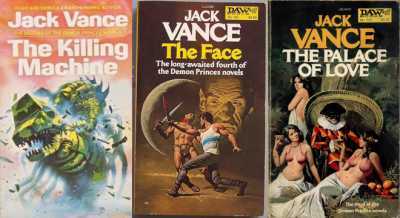 Believe it or not – that is exactly what Jack Vance has managed to do with his demon prince series. And how! The story is set in a futuristic dystopian world where humans have broken free of the earth and gone on to colonize multiple planets. A world where human and aliens coexist in a melting pot that is the universe. A world with technology of the future. The story as such is pretty straight forward. The series has five books – each one dealing with the story of revenge against one of the villains, making each book a good standalone read as well. So what makes the book so appealing? Three things in my opinion – the effort that has gone into the detailing of the futuristic world, the buildup of the villains’ personalities and the twist in the tale ending that revolves around the science fiction elements. Talking of the first, that is indeed the one that would appeal most to science fiction buffs. Usually we see more detailing in near future stories. Here Jack Vance has taken a story set in distant future and detailed it very well. He has really put a lot of thought and imagination into envisaging the various social, cultural and economic aspects could that emerge in a world with multiple intelligent species spread across multiple world having numerous new technologies such as rapid space travel, life extension substances, ultra destructive weaponry etc. Some of the elements are introduced to us a part of the drama while the author has to take recourse to other constructs such as footnotes, excerpts from tomes within the story world, newspaper and television reports, anecdotes, court judgement excerpts, philosophic quotations etc. for others. One of the things that I found especially worthy of mention are some of the futuristic corporate and administrative entities he has created in his stories. The 'Institute' is one of the most powerful organizations that seems like cross between an order of Shaolin monks, Mensa and secret brotherhood of knight Templars. Then there is an Inter World Police Coordinating Company, a policing entity that runs like a commercial enterprise. The one I found most interesting was the ‘The Interchange’ that provides a kind of escrow service to facilitate honest kidnapping and ransoming. The second fascinating aspect of the stories is the aura that is built around each of the antagonists. There is a lyrical quality to the way the villains have been created. Each villain is in some ways a personification of one particular sin and around that Vance weaves the villain’s strengths, his weaknesses, his interests and his motivations. Attel Malagate is a seeker of power and pride, Kokor Hekus likes to experiment with fear, Viole Falushe is a perverted romantic who wants to creates clones of the woman who jilted him in his childhood to experiment with live, Lens Larque is a dour sadist with a wicked sense of humor and Treesong is a highly imaginative and delusional chaoticist. The author also gives us glimpses into the early life of these men and how they came to be who they were. In some ways, the story is more about the antagonists than the protagonist who seems drab in comparison. That is why even the series is named ‘Demon Princes’ after the villains and each book’s title refers to the distinguishing characteristic of the ‘Demon Prince’ who plays a main role in that story. The third element is obviously the twist which I can’t reveal without giving away spoilers. What I can say is the twists fit beautifully into the intricacies of the complex world Vance has managed to create. In some ways I see it as a well-conceived future world scenario that the author has constructed and then build drama around it to keep the reader hooked with the events culminating in a very interesting twist based on the technology, economic and societal aspects of the world he has created. That way it becomes imperative to understand the world to enjoy the story. So one has to really get into the science fiction elements to truly enjoy these stories. The books do not offer much by the way of depth of psyche exploration or insights into deeper meaning of life. So people looking for those would do well to give this series a miss. The books are light breezy reads despite being set in a dystopian world and deal with dark themes such as murder, greed, revenge etc. The stories don't really disturb you or make you reflect at a personal level. To some extent it may make you think about the direction human society in general is headed though. It is the kind of book any lover of crime and thrillers would easily enjoy if he or she can get past the science fiction elements. These books are just the kind I would love to see made into movies. But I am surprised there are no popular movies based on them. That is one more temptation to splurge in science fiction one more time, except that the TBR pile in my bookshelves and on the tabletops far exceeds the explored lot. 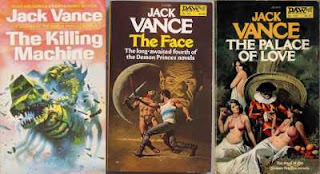 And yet, I have taken note of Jack Vance. Yeah - you should try when some time you are looking for something light and imaginative. Yeah - him and Dickson I guess. They were the first ones I borrowed from you if you remember. Always great to know that there are more SF authors worth reading. Nice post TF, thanks again. You should try him, Ramesh. His books are real fun reads. Once my current stash of books is over, will definitely want to explore the SF genre and for that, I will come to you for guidance!